Like with any type of marketing, SaaS marketing is all about understanding your customers. If you don’t know your audience like you know yourself, you might as well pack your bags and choose another career. That’s how crucial it is. But sometimes, you can know your audience super well, and you just get…stuck. It’s happened to even the best of businesses. Your product development, marketing, and launch could all be on point, and everything could still go belly up. Maybe you’re only getting a few sales, so you get demotivated. Is your product really good after all? Could you be doing something better? What gives? The answer might be that you don’t understand your product adoption curve. If that term doesn’t ring a bell for you, you owe it to yourself to read this article. And even if it does, you should still read this article. Because getting to know the product adoption curve and applying it in real life can turn your SaaS marketing around. You’ll be able to plan better, and you’ll know what to do every step of the way. Most importantly, you’ll gain a deeper understanding of your audience, and your product lifecycle will go a lot more smoothly. 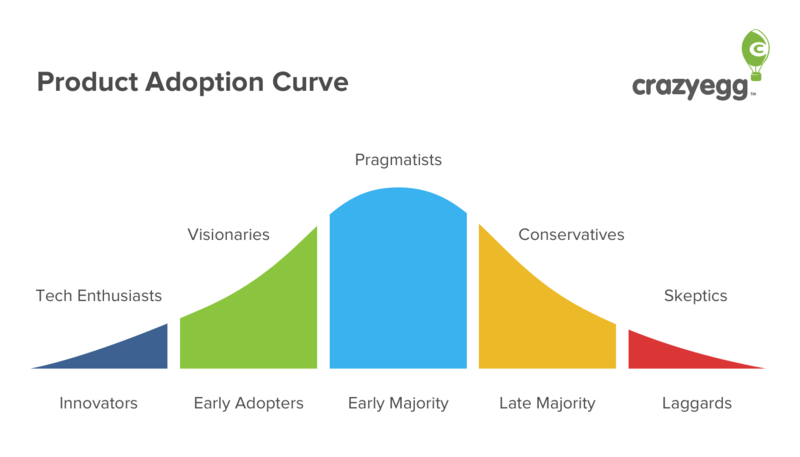 The product adoption curve is a standard model that reflects who buys your products and when. Think of it as the big picture view of your product adoption. 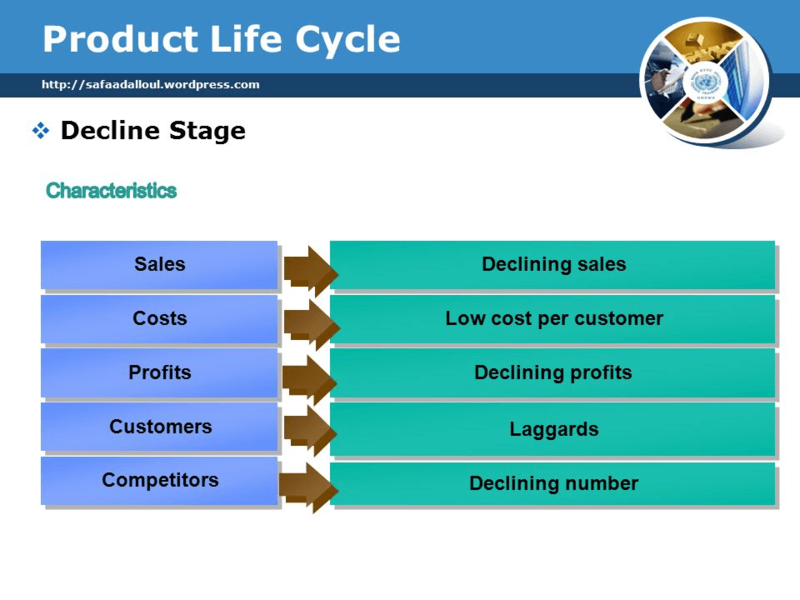 It takes the product lifecycle and considers what happens at different points. In most product adoption models, there are five distinct stages. Each stage represents an arbitrary amount of time, so what’s most important here is the process as a whole. Now let’s break this down step by step, stage by stage. The innovators are the first group of people to invest in your product. This is a unique group. People who buy super early are usually obsessed with SaaS and want to keep up with the cutting edge of SaaS technology. However, this group can have lots of variety in terms of specific customer types. For example, maybe someone just really needed your exact product. What’s most important about this group is its size. You might have noticed that it’s small. That’s completely normal. This is why you might only get a few sales immediately after you launch. You’ll typically get about 2.5% of your total sales from innovators. You might have a higher percentage of innovators if your marketing went really well and reached a wide audience. Or you might have a lower percentage of innovators if you’re relatively unknown in your niche. So use the 2.5% as a benchmark, but remember it’s not true for everyone. At some point, you’ll see a swell in sales, and you’ll start to get a steadier conversion rate. This is probably because the early adopters have arrived. 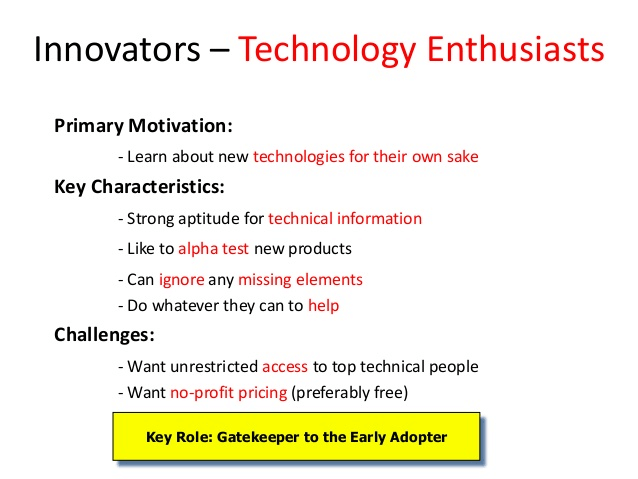 Like innovators, early adopters tend to be ahead of everyone else, willing to test the waters. 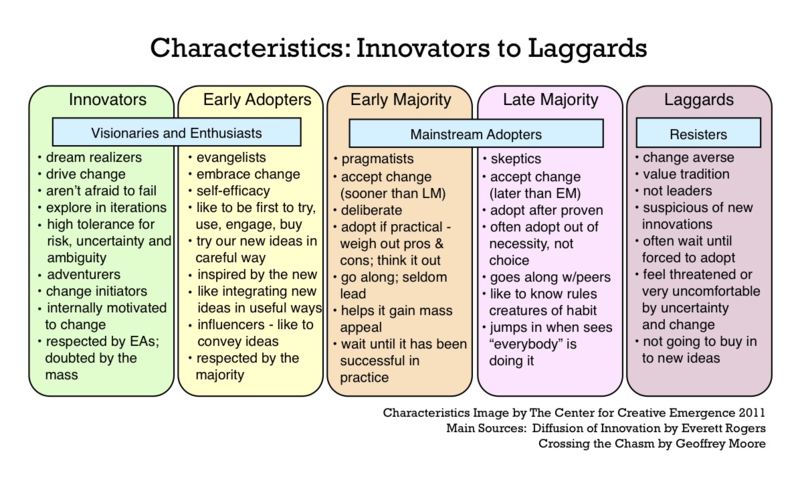 Although early adopters are similar to innovators, there are some important differences. It could be the case that early adopters have purposely waited to buy your product. Whereas innovators are fine with rushing in and testing out something new, early adopters are a bit more hesitant. They still want to try something new, but they want a few reviews to consult. Then again, it could be the case that they just found out about your product. Expect your percentage of adoption to go up to about 13.5% or so. Here’s when your product really gets some momentum going. You’ve got a good amount of sales from innovators and early adopters. At this point, usually an even larger group sweeps in and gives you a heck of a lot more sales. Specifically, about 34%. 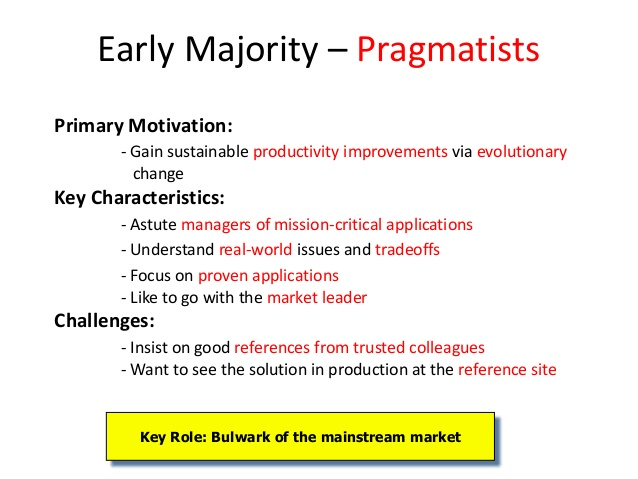 The people in the early majority are usually pragmatic and will only buy something once it’s been road-tested (at least a little bit) and has proven its value. This is the beginning of your product’s peak. 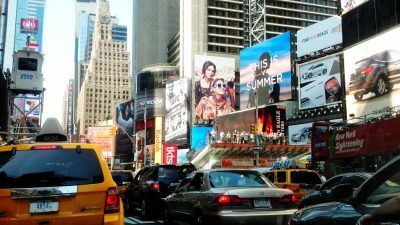 Maybe it’s gained traction with more marketing or word of mouth. At stage 4, your product has been out for a while, and there’s widespread use. However, there are still some people who are a bit skeptical of your product. Once they’ve put their worries to rest, they buy your product, and these people are usually in the late majority or laggards. At some point during the early or late majority phase, you’ll have your peak where you get more sales than ever, and your product is at the height of its popularity. Interestingly, in terms of adoption rates, the early and late majorities are usually roughly equal, around 34%. These are the people who buy your product after all the hype has died down. Sometimes, laggards purchase a product years after it’s been released. 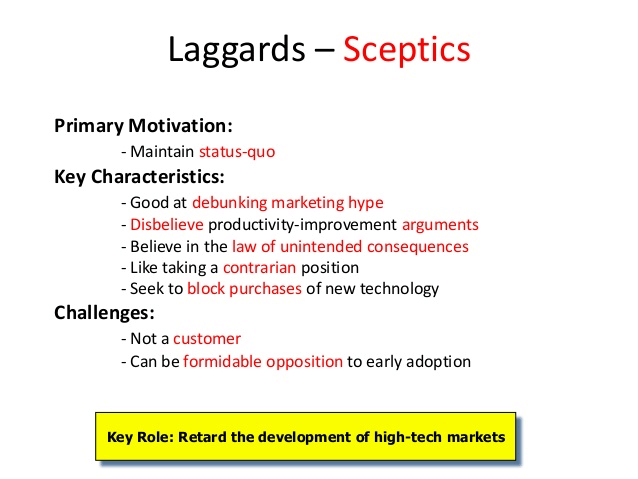 Laggards might be extreme skeptics or people who have only heard about your product a long time after you launched it. Whatever the reason, these people don’t buy until much later in the product lifecycle. Surprisingly, this is a pretty big group. 16% of your product adoption will come from laggards. Try to wrap your head around the fact that laggards have a higher adoption rate than early adopters. We’re going to dive into why that happens as well as a few other ways you can hack the product adoption curve. Here are three strategies you can use. 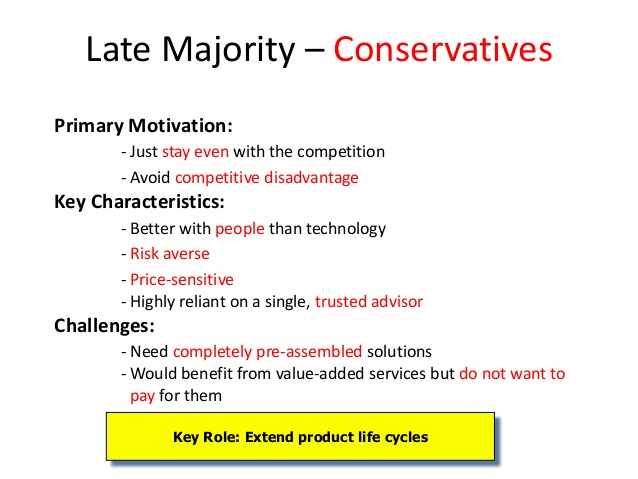 At each stage of the product adoption curve, it’s likely there’s going to be certain demographics buying your product. For example, innovators are more likely to buy on impulse, while buyers in the late majority will do lots of research before purchasing. And as your product gets older, it will become more well-known. So you might start out with a product no one knows but end up with a product everyone and their brother has heard of. Given these facts, consider changing your marketing messages as your product ages. Here’s a classic example: the iPhone. A commercial for the second generation iPhone showed off a lot of the hip new features: music, email, and Internet browsing, to name a few. This obviously appealed to a younger, more tech-savvy audience. Apple wanted to show that even grandparents (who may not have understood smartphones back in 2010) could benefit from the iPhone. This is important because older consumers are typically late adopters. Apple’s strategy was clear: Begin by showcasing all the bells and whistles, then open up the audience to include more types of customers. In the same way, you should think about what your marketing should look like at each stage of the product adoption curve. For example, when the innovators and early adopters come rolling in, your marketing should clearly describe the value and benefits of your product. Later on, perhaps in the late majority stage, you can utilize customer testimonials and reviews. This can help address the skepticism that later adopters typically have. Think about addressing the common questions that each group has. Innovators will ask themselves what’s so unique about your product, while the early majority wants to know what other people think about your product and why it’s useful. Thinking like this can completely change your marketing. By sending a customized message every step of the way, you’ll battle objections and questions head-on. In most product adoption curves, there’s a point that can make or break the success of the product. It’s called the chasm. 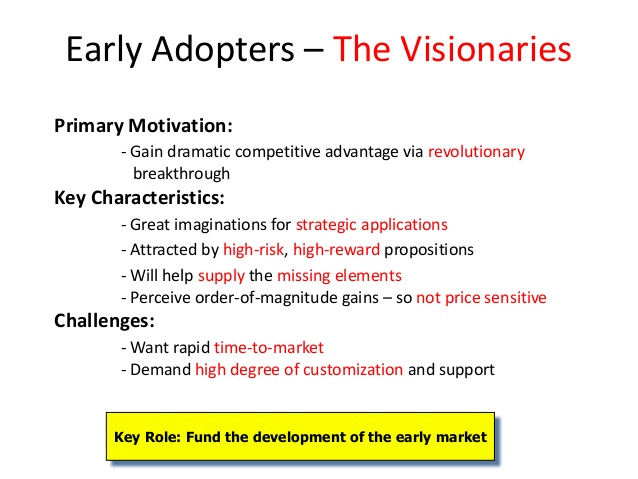 It’s the point between the early adopter stage and the early majority stage. 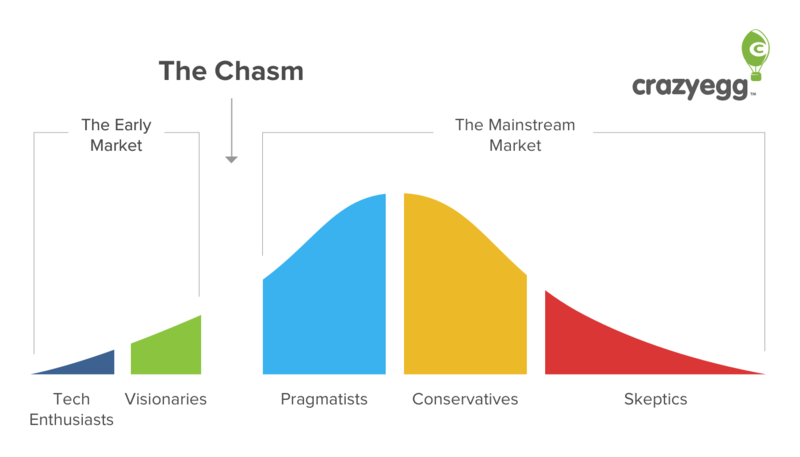 As the chart above represents, crossing the chasm means breaking into the mainstream market. It’s one of the most difficult aspects of product adoption, but it’s one of the most important aspects to get right. There’s even a bestselling book on the topic––Crossing the Chasm. 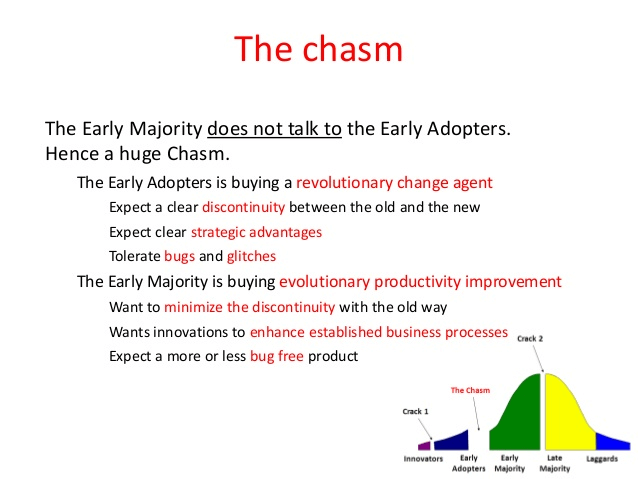 Crossing the chasm is particularly tough to do for a few reasons. One reason is that as your product ages and grows, your audience will have higher expectations. Specifically, your potential customers will want increasingly better reasons to buy your product. You have to be ready to meet these demands throughout your product’s lifecycle, but it’s especially important in getting past the chasm. As impulse buyers, the innovators and early adopters didn’t need huge reasons to buy your product. But to get the early majority to convert, that’s exactly what you’ll need. You have to think about your branding and not just your product. You have to offer value and not just features. Another reason for the difficulty is the possible necessity of pivoting. In other words, to cross the chasm you may need to take a new angle for your campaign. Early on, you may be hedging on the idea behind your product. Early adopters are cool with that, but the early majority wants consistency. If you’re at the chasm right now, you might need to pivot yourself or even improve your product. You can’t stop after your product has hit its pinnacle and is riding the waves of success. Remember, the second largest adoption group is laggards, coming in at 16%. A lot of people will be buying your product well after the hype dies down, and you can’t forget or alienate this audience. Laggards are often skeptics, so at the end of your product lifecycle, your marketing should be laser-focused on overcoming objections. Think about it––you’re marketing to people who resist change and may not even want to be a customer. Time also plays an important role. Think back to the iPhone example; sure, older folks are commonly seen with iPhones, but it’s been a decade since the device’s initial release. In terms of SaaS, this could mean that certain companies are content with the software they’re using now. It might take a lot of time and exposure to your brand for them to change their minds. Finally, you’ll also need to brace for the declining sales that inevitably occur at the end of the product lifecycle. This is a natural part of the lifecycle, but you still have to be ready for it. The product adoption curve is one of those concepts that’s tricky to master but incredibly rewarding when you do. It requires a lot of attention to your customers––a lot of listening and changing. It’s not for the faint of heart. But creating an awesome product and having a successful launch isn’t exactly a walk in the park, either. If you’re going to try to make a mark, you might as well go all the way. 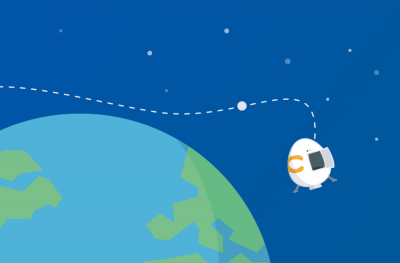 Knowing when, why, and how your customers adopt your product can revolutionize the way you see your product lifecycles. 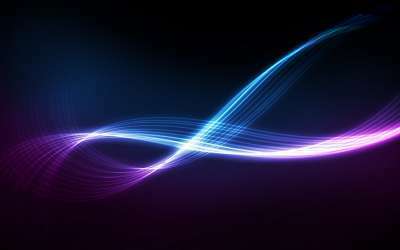 You can plan ahead for each stage of the curve, and you’ll be better equipped to adapt to any unforeseen changes. Like I mentioned at the beginning of this article, understanding the product adoption curve is ultimately about knowing your customers and catering to them. You need to meet your potential customers where they are at every stage of the product lifecycle, whether that means exciting the innovators or convincing the laggards. It can mean the difference between an okay product and an outstanding product.